But there are so many other cards I really enjoy for other reasons - memories of my past, awesome designs, great photography. Perhaps a new challenge could be created around "your favorite card because of..." topics? Let me know when that happens. My collection has gone through purges a few times; some baseball cards were purged in 1998 along with souvenirs and memorabilia that I'm really sad I got rid of. However, I don't think any actual "favorite" and irreplaceable cards got away. The second purge was when I dumped a bunch of awesome hits in my non-sport and baseball collections. I later regretted a lot of those losses and I have since reacquired many of the cards I sold back then. One card I didn't sell was an autograph from a 1998 movie that has been mostly forgotten: Small Soldiers. Kirsten Dunst was my favorite actress for quite some time; I saw all of her films during her most popular years and even bought an issue of Seventeen Magazine where she was on the cover. I got the card via redemption and was able to redeem it even after the expiration; Inkworks was an amazing card company and it's too bad they had some horrible luck that led to their bankruptcy. You can see the card on display in the upper-left corner of the photo above. I don't have a good scan of the card because it must still be attached to that framed display, somewhere in storage in Georgia. God, I hope it is. I'm actually thinking of saving up for a "backup" copy of the card in case the original has been lost or damaged. Much like Schrodinger's cat, the card both exists and doesn't exist until I'm able to return to Georgia and sort through my storage unit. But I consider it to be my most favorite card, the highlight of my personal collection. In fact, it was the only card that was displayed like this in my old apartment. The only card that could possibly top it would be an autograph of Robin Williams or Tom Hanks. Yet again, COMC comes to the rescue. I'm glad this challenge consistently makes use of the "A" in the challenge - A favorite card.... Without it, I don't think I could have been honest with myself and my readers. With so many of my cards out of reach, I've had to make compromises. I do love the cards I've posted, but if I had access to my entire collection, I might have made different choices for most of the posts. And if it wasn't for COMC, I probably would have brought you another menko. I really enjoy getting new menko for my collection, and the older ones are the best-looking. But I've been working on meeting my 2017 collecting goals. You know, the ones I posted about at the beginning of the year? I've met seven of the 20 goals already, so I think I should be pretty close to 100% this year if I don't actually finish all of my goals. One of those goals is to reduce the "type 1" want list to 50 cards. 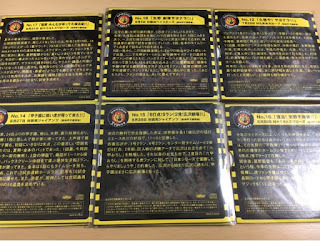 Type 1 is comprised of base cards from major releases; it's not perfect, because there are some sets on that list which many people would consider oddballs, including several TCMA releases. The earliest set on that list is the 1887 Allen & Ginter's N28 set. It's a famous set even with modern collectors thanks to Topps' homage issued over the past ten-plus years. Known for its beautiful paintings, the set has "champions" from several different sports. On Sunday, I finally added one to my collection. It's in nice condition, especially since it's 130 years old! And while it's not a baseball player, it's from that same set, and the base ball players are listed on the back along with this guy, John McKay, an oarsman. Oddly enough, this is kind of difficult. As a pop culture enthusiast, a large part of my "personal" collection is focused on entertainment autographs and relics. And over the years, I've put together what I feel is a pretty impressive collection of my favorite actors and actresses. No, you won't find Robin Williams or Tom Hanks autographs, unfortunately. But I do have a relic card with Jennifer Garner's latex dress from Alias. And Levar Burton and Bruce Campbell's autographs. And dozens more relics and autographs. I have some beautiful patches, too. When Playoff/Donruss lost their MLB license in 2005, they dumped some awesome swatches in their packs, and I've grabbed a few nice ones. Regardless of the subject on the card, if it's a unique item I'm interested in having it in my collection. I've finished one relic set, and I started it just by chance. I came across a bunch of the Japanese team relic cards from an Upper Deck USA release a couple years ago, and used COMC and a little luck here in Japan to finish the set inexpensively. There are a couple other relic sets I enjoy: Bazooka Adventures and Fun Facts relic sets, and the Currency Connection coin sets from Topps Gallery. I'm chasing Adventures and Fun Facts, but I'm not actively searching for Currency Connection cards due to their price. My player collection has relics, too. Some are easier to find than others; Pujols has lots of swatches out there, while Julio Franco does not. The rarer ones are sometimes more treasured because of the effort it took for me to obtain it. I'm happy to have all of them in my collection, too. As far as manu-patches go, they're cool, but overpriced. I tried to collect some of the manu-patch sets from around 2004 (Sweet Spot, UD Patch Collection) but had to give that up because of cost. One of my favorite relics is one of my newest. Or, two of my newest. I collect gymnastics autographs and relics, and Aly Raisman has a relic card in 2016 Goodwin Champions. I have both cards above in my COMC account. They are certified as being used in a gymnastics event, and are obviously not just from a T-shirt. I would guess that the swatches are either from a leotard or a warm-up suit. I guess I could show you more of my "awesome" relic cards, but they're all in the US. In fact, if you're wondering why so many of my card images have come from COMC, it's for that same reason. The majority of my collection is in America. So, thanks, COMC, for letting me use your images... of my cards and others'. Today's oddball brings us back to Japan. While the challenge is to post an oddball "card" from 1990 or later, I chose to highlight one of the other collectibles you can find here. Team loyalty is pretty strong with most baseball fans here; there are very few people who are just fans of the game. I guess the same is true in the US, but I feel like the bond here is stronger. And for big fans, that means buying jerseys and sitting in the cheerleading seats, learning the cheers so you can chant along at the game. I think the reason BBM can release full team sets every year for every team is because there are fans for every team, and they want to collect their team's cards. Can you imagine Topps releasing 30 different team pack-based products every year in addition to all the other product? And the teams themselves have tons of products, including series of collectibles. 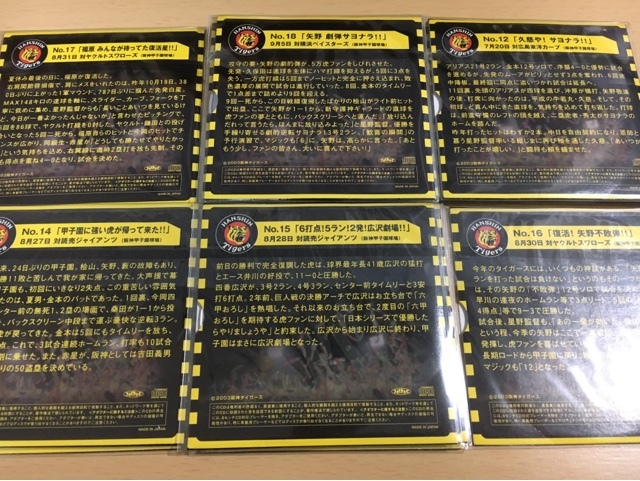 For example, I recently picked up a big lot of pins issued by the Chiba Lotte Marines. For the past several years at least, they have issued pins for many of the popular players in various series. I've seen buttons, keychains, and all manner of other small things that can fit into the gacha-gacha (capsule toy) vending machines. Every team has something every year, if not multiple things. And the Tigers, being the popular Osaka-area team, get a few other product tie-ins as well. Glico is a major snack company based in Osaka, and they have partnered with Hanshin multiple times for various collectibles. In 2003, they issued trading cards packaged with chocolate to highlight the team's victories in the first half of the season. And today's product was sold in 2003 as well. The picture you see here is not of cards, though. Each of these is a small CD cover; the outside designed to look like a newspaper. Actually, it may be a redesign of an actual newspaper cover story. The CD itself... well, I don't know. I've never opened it up, but I believe based on the packaging that it's just audio, probably a recording of the broadcast from the game featured on the front. The backs have details on the game featured on the front. I believe these were sold in two series of 10, as there are 20 cards in all in the set. I'm missing a few CDs for a full set, but I'll find those eventually. While these aren't cards, they are pretty cool oddballs and nearly card-sized. I mean, Upper Deck included CD-ROMs in packs, Pinnacle sold cards in soup cans, and Topps makes stickers. Now I just need to pop one of these into my computer and see what happens! It's all about the backs today. What is oddball, exactly? "Anything not mainstream" is the easy answer, but what is that? Is Panini oddball, since it has no logos? I don't think so. What about online-only products like Topps Now? Convention and show promos? I have an "oddball" category in my type collection, and generally they don't make it. But some major manufacturers do have oddball products in my opinion. And since I've featured non-major brands for the past few posts, it's time to look at mainstream oddballs. The 1980s were a time of growth for baseball cards. New brands popped up, and cards tied in with products grew in popularity too - Bazooka cards made their comeback, 7-11 had Slurpee discs, and teams partnered with local businesses to give away cards at the stadium with police department tie-ins. Even K-Mart and Woolworth had their own sets. Topps helped produce many of those, but they also experimented with their own releases too. They tried mini cards again about a decade after the 1975 set, and then went the opposite direction with Topps Big. I love the Topps Big set. The fronts aren't terrible, though the borders are quite large given that the card sizes are larger. I think they just scaled up the border. The backs are the best, though, because Topps geared this product to kids with a large part of the card devoted to a cartoon about the player. They basically highlight different events in the player's career - Smoltz was a rookie so he didn't have many MLB highlights, but Topps focused on his minor league and school day success. It would be nice to have more personal tidbits tossed in here and there, and maybe there are some - unfortunately my set is on the other side of the planet so I can't study it to find a favorite cartoon. Isn't it odd that a guy who never read a comic book in his life enjoys comic panel-style art on his cards? "What is that?" you ask. "Is that a random small photo that somehow made its way onto COMC? Well, kind of. Except the back identifies it as an actual trading card! TCMA issued dozens of topical sets in the 1970s. And while people collect Topps because of its longevity, people look for TCMA sets for their history. TCMA is one of several brands that issued smaller sets featuring retired players who hadn't had a baseball card in years, or ever at all. When I was a kid absorbing all he could learn about cards, I bought my first Beckett Almanac and studied all of the sets inside. I loved reading about the old tobacco and caramel sets, and dreamed of someday owning them. I knew that wasn't really possible, but a kid can dream, right? And as I continued looking through the guide, I saw all of the sets issued by TCMA, Laughlin, Colla, and Fritsch. TCMA probably did it best, selling sets from around 1972-1987. The simple card you see above is "just" for my type collection, and is pretty simple and uninteresting on its own. But this card represents the beginning of the TCMA era, as it comes from their first set listed in my SCM guide. I have type cards from most of TCMA's mini sets, and several of their issues have helped supply more-affordable cards of early stars for other parts of my collection. And I can see this particular set becoming very helpful for my one-of-every-player collection, too. I think the simplicity of the card adds to its appeal. Many of TCMA's early issues have backs that appear to have been finished on a typewriter - the basic design might have been typeset with individual card information typed over a template. The most appealing of TCMA's sets are the 1952 Bowman "extension" and the other art cards they issued, mostly in the 1980s. But even with these relatively unappealing or simple designs, the other sets are great for player, team, or historical collectors. As a kid, I had plenty of time for reading books. And when I got into baseball, I naturally started picking up baseball related literature. I read a few novels, but what I really liked were true stories. I read a biography on Babe Ruth and studied baseball statistics reference books. One of my favorite types of books were the ones full of short non-fiction tales. These were more than just simple stories of victory or adversity, instead focusing on the strange. Some books told about players like Eddie Gaedel, while others retold stories of big blunders on and off the field. The Nu-Cards Baseball Scoops set is just like that, giving a very short look at some of the more interesting happenings in baseball, both memorable (like Gehrig's consecutive streak record) and slightly odd (like the blown call above). I would love to have a full 80-card set! Someday, I might try to put one together. Honorable Mention today goes to the 1969-76 Fleer Cloth Patches. Team logos are art, too, and logo stickers are a fun oddball to collect. The Indians logo above probably won't be revived anytime soon. I don't have many 1950s cards, and those that I do have aren't exactly oddballs. I love oddballs, but getting them isn't easy, especially not living in the US. I could scour eBay for bargains or spend lots of time on COMC checking for new cards I don't have. I could, but I don't have time for that. I could post some more menko cards from the 1950s - for all of you in the States, menko cards are oddballs. But those were the norm back then, so I feel it's cheating just a little to do so. As far as US cards go, I think the 1950s Red Man cards are beautiful, with nice paintings of the players. The best ones have visible stadium backgrounds instead of solid color backgrounds, like the Robin Roberts you see above. Honorable Mention goes to this game card for the very visible beanball. I mean, he could have been hit in the arm or leg, or even drilled in the ribs. But, no, the 1957 Ed-U-Cards baseball game chose to show this poor cartoon guy getting a concussion. He's not even wearing a helmet! We're moving into the final quarter of this challenge, and I must say that it's been fun. There is a tall stack of other stuff for me to post, but I doubt I'll be getting to that until next month. I guess I won't run out of post ideas for a while, huh? While this comes from an insert set, it's not supposed to be terribly uncommon. In fact, based on odds at BaseballCardPedia.com, it's one of the most common inserts found in packs - 1:4. I didn't have much trouble finding the other 9 first series cards, and I'm pretty sure I have the SP 11th card found in the second series. But for some reason, the NHL Winter Classic card remained quite elusive. Elusive to the point that it's not found on COMC (sold out), Sportlots, or eBay. I finally got one in an eBay auction last year, but this card is one tough cookie. Is someone hoarding all of the copies? Was it short printed? From a base set, one card that I finally got was the Robinson Cano from 2008 Stadium Club. Again, not quite a "common" card, as '08 SC has a ton of short prints. But there are 999 copies of this card, and I've never seen one. The whole 2008 Stadium Club set is full of short prints and variations, and to get around the difficulty and price of obtaining the regular SP'ed base cards, I have been getting parallels too. Many times, the parallels have been the only versions available, and in several other cases, they are cheaper than the base cards. Just yesterday, I picked up a parallel from Sportlots to finish off the "short" veteran base set. My '08 Stadium Club set is getting closer to being a full master base set - I have all of the veteran base cards (or parallels) and the "A" version rookies, most of the "B" version rookies (41/50), and a handful of cards from the autographed rookies subset. Those are premium releases, and the cards are of celebrities - Jay Z, Shannon Elizabeth, and so on. I've finished off the other subsets from that year, but those five cards remain evasive. I think some of them are SPed. That quad relic isn't on my want list, though it would be neat to have. I haven't chased it extensively, but there are some common cards from a fairly common set I still don't have. The 1996 Collect-A-Card Centennial Olympics set remains unfinished, as I still need #2, 18, 22, 56, 64, and 105. And the POGs #11 and 18. And posters #4, 6, 7, 10, 15, 16, and 17. That base card above is one of only three listed on COMC, and the asking price is $10 (currently on sale for $6.25). I can buy a whole set on eBay for less than that if I really want to! So those are the cards that did and still do remain missing from my collection. Can anyone help a collector out? I'm not the investing type. I only buy Bowman for my type collection, not for prospecting. I don't hoard RCs and keep an eye on who's hot and who's not. It's entirely possible I have a 1993 SP Jeter rookie sitting in a box in Georgia. Or any other 1990s high-value rookie card. When opening cards at a shop, occasionally I'd get a card that the owner expressed interest in; "Oh, he's going to be good for Seattle next year!" "That's the best rookie in the set!" I'd get a little happy with my luck and completely forget about it. If anything, I'm the opposite. When I buy cards for my type collection, I go after the cheap players. For the Awards collection, I wait if I can't find a cheap card for the ROY award. I rarely, if ever, collect sets focused on rookies, unless it matches one of my existing collections (Diamond Kings, for example). That said, there are two players that I've collected since their rookie years. The first was Jose Altuve. I was very impressed by his action on the field in 2011 when I saw him a couple times in the LA area. And I got a bat he broke during the game, which I will keep in my collection. Who needs relic cards when you have actual relics? Anyway, as soon as I saw him on cardboard, I grabbed what I could. Obviously, he's turned out to be a very good player, and there are a few cards I can't find at reasonable prices that I missed out before. The second is Buck Farmer. I collect him because he was my student in high school and I was a coach for the baseball team. I'd love for him to make it big, but I'll never sell my collection of his cards even if he does. So I'm not really investing in either player, though a good bit of money has gone into each collection. I'm all about oddballs, and while I don't buy much of it, I love vintage. So I started thinking about vintage parallels and oddballs. Checking my database, the first real parallel can probably be considered to be the 1975 Topps mini set. It was a unique release, though, not marketed with the regular cards as a parallel. You could go back further than that. Tobacco cards had a variety of backs based on the product the cards came in, but most people consider those variations, not parallels. And I do too. But I do think having all those different card backs would be cool! The regular refractors look pretty cool; I liked refractors all the way back in 1993 when they debuted with Finest. And those 1993 Finest Refractors are beautiful. But I like Chrome's parallels better simply because of the rainbow of colors they offer. Sure, Finest has colored refractors too, but Chrome's colors just look better on those "white" bordered cards Chrome was itself a parallel of. It wasn't until 2002 that Topps Chrome got colored refractors. And it was only black and gold. In 2003, they added silver. That's kind of confusing, since the base refractors are essentially silver. Two more types were added in 2004 - red x-fractors in the regular set followed by regular, but uncirculated, x-fractors in the traded set. The 1/1 Superfractor made its debut in 2005 as a gold card. The blue debut came in 2006. We had white in 2007. This made sense in a year where the base cards were black, negating the black refractors. 2008 saw the first copper refractor. Green had been a part of Finest for a while, but it didn't come to Chrome until 2010. I count 13 parallels in all in 2011 Chrome. And a few were new. Atomic Refractors and Sepia Refractors were most common. The Gold Canary Diamond was the most challenging, with a 1-per print run. After no new colors the next year, 2013 brought camo and pink as two limited parallels. Topps must have ran out of ideas, because again 2014 saw nothing and 2015 only saw Prism, which is a variation on SuperFractor, X-Fractor, and Atomic Refractor styles. And 2016 saw Blue Wave, another variation on the previous year. Panini put out more in Optic and 2015 Prizm, but Chrome remains my favorite. Those 2015 Prizm parallels have been fun to collect, though - the only one I don't have for Buck Farmer is the 1/1 Black Finite. And those Upper Deck Masterpieces parallels are very difficult to distinguish from each other at times. Did I miss any other super-parallel sets? I could take the easy route. I live in Japan and have a ton of cool Japanese cards to choose from. 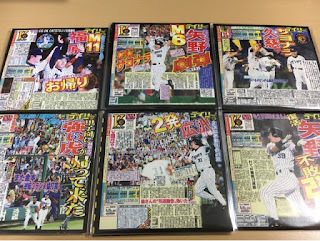 Menkos, old Calbee cards, bromides, autographs, relics. Ichiro's rookie card. And so on, and so on, and scooby dooby doo. First is this autographed card from the CPBL. It's numbered out of 200, and is one of two autographs I have from CPBL releases. I like it not just because it's autographed, but because it has a clean, attractive design. If I remember correctly, the base cards from this year had a similar color scheme with a design that resembles a letter or envelope. It has hints of retro but isn't quite throwback. I really should go back to Taiwan to visit the card shops and go to more games. And do some sightseeing too, of course! I also really like this credit card-style card from 1991 (if I'm doing the year-math correctly). It's one of the first CPBL card issues and has a nice clean design. Plus, it's difficult to damage! While the CPBL is still young, it's great to have some cards from the league's infancy. I have a few other CPBL cards, but not enough. I'd really like to get caught up on my type collection and discover what they've offered up over the past five years! Meet Bobbly Cox. Bobbly Cox is the newest bobblehead in my collection. 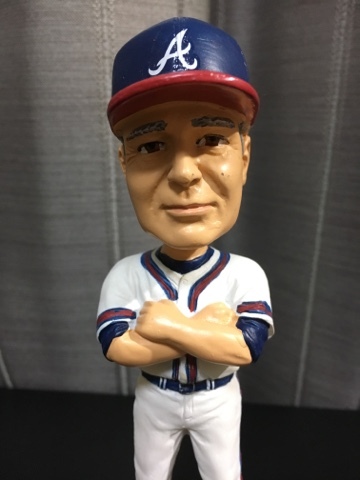 Bobbly Cox is done in the likeness of Bobby Cox, the Hall of Fame manager of one of my favorite teams. Without any intention for today's post, I picked this up today from a secondhand shop. I didn't notice the little label on the box, but it turns out that the little Hall of Fame plaque at the bottom had broken off. Someone must have tried gluing it back together, and it broke again. A few drops of superglue later, and we'll see how well it holds going forward. Bobby Cox isn't a player I collect, yet. 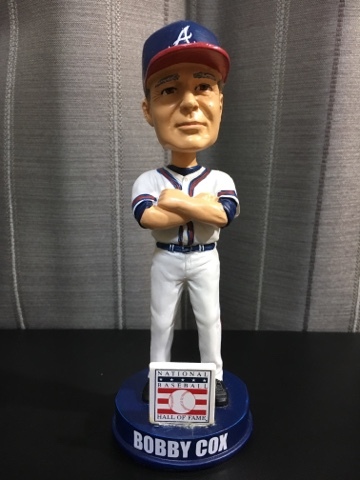 But now that I have this bobblehead, I'll eventually get to making a collection of his managerial and playing day career. Speaking of which, Bobby didn't see much action on the field until he was in charge. He played some third base for the Yankees in the late 1960s, but had bad knees so basically gave that up. He also played a few years in the Venezuelan Winter League. With very little playing time, he has only one mainstream card: his 1969 Topps card. I don't have it yet; I do have plenty of Cox from his managerial career scattered throughout my collection though. I find it interesting that Cox was an All-Star rookie that year, despite being on his way out. He managed to get 9 home runs and 58 RBIs during his brief time with the Yankees, finishing with a .225 batting average. In the 1970s, Bobby Cox got his start in the dugout as a coach and manager in the Yankees minor league system and managing in Venezuela. He was the first base coach on the World Series Champion 1977 Yankees. As manager, Cox started with the 1978 Braves before moving to Toronto. His first stint in Atlanta wasn't very successful overall (266-323), but he managed to rebuild a team that would then see some success in the 1980s. He also moved Dale Murphy to the outfield, which probably is the only reason he was eventually able to have a successful career. In Toronto (355-292), Cox was able to slowly improve the team until they finished first in 1985, eventually losing in the ALCS to the Royals. He then returned to Atlanta as the General Manager, eventually making himself manager in 1990. The next year, after a last place finish, the Braves made it to the World Series. They would make it to the playoffs every year through 2005, an unbelievable accomplishment led mostly by great pitching. Maddux, Glavine, and Smoltz would give Cox one World Series ring in 1995. The 2006 season would be the first of many bad years, and while the Braves made the playoffs in 2010 and 2012, they haven't been anywhere near as dominant as they were in the 1990s. Cox was a mainstay as important as Chipper Jones in Atlanta, and despite not really having a hot temper, he holds the record for the most ejections - 158. I was at the game on August 14, 2007, when he was ejected for the 132nd time, breaking the previous record held by John McGraw. Bobby Cox is one of only four managers with more than 2500 victories - he finished with 2504, and a winning percentage of .556. He is also one of only four managers with 2000 victories as manager of one team, and is fourth all time on the managerial wins list. He was named manager of the year four times, and eight times by The Sporting News. The Braves are one of my favorite teams, owing to the fact that I lived in Atlanta for almost 20 years, through their dynastic period. And they are the team I can associate with the most, as I've seen more games in Atlanta than everywhere else combined. It's only fitting that Bobby Cox is the manager I feature today. This is basically the same for me as day 3. I believe the first set I completed fully was 1992 Topps. And back in 1992, all my cards came from packs - I don't think I traded to finish that set, although I had card collecting friends. I stopped buying tons of boxes of the same product soon after, instead "sampling" each product with a single box. Back then, it was affordable.. or, at least, my family/I was able to afford it. I don't remember if I hand collated any sets or just bought complete ones. Or maybe I did neither. Or both. Really, who knows? I do remember buying a whole bunch of junk wax at one point and putting together sets - 1990 Donruss, some late-90s non-sport stuff. You know. But since I had no focus and just opened packs and collected for fun, I don't really remember what sets I finished. It just wasn't important. Which may be why I stopped collecting - with no focus, buying boxes had no purpose. Speaking of non-sport, I spent a lot of money trying to finish the Casper movie card sets. I somehow completed the Fleer set, but I'm still missing cards from the Ultra set. Does anyone know any non-sport single card dealers? I'd love to finish that and a few other sets. Anyway, when I got back into baseball card collecting in 2003, I started as a player collector before starting my type collection. I also started chasing insert sets that I liked. (That's three starts in a row...) I've finished a bunch of those sets, some by hand and some through complete-set purchases. Because I kind of went on a set-buying/building blitz, I can't tell for sure what set I completed first back then. But, I had a mini-hiatus in 2009-2010, where I collected a little bit but again was focused elsewhere. In 2010 I basically restarted my life, moving back to California, and again returning to cards. And the most important first set I built pack by pack was 2011 Topps. 2011 was a great year for me as far as card collecting goes. There were some great releases, and the flagship set was one of them. I finished the entire set - Series 1, 2 and Update - pack by pack. In fact, I did most of it with retail packs, just like when I was a kid. And not only did I finish the base set, but I also put together the 60 Years of Topps, The Lost Cards, Kimball Champions, and Reproduction insert sets, and earned enough points through the online giveaway to get the Diamond Anniversary factory set, too. Over that year, I would finish a lot of other sets, too, technically before finishing Update, but this one stands out in my mind. It really was like I was a child again - I would grab a few packs as I checked out at Target or WalMart, and open them up in the car to see what I got. I kept a want list and traded with a few of you all to get the last few singles I needed. Beyond the fun of opening packs and the sense of accomplishment that comes with hand collating a set, the interaction I had sharing the set on this blog and trading with others across the country really made this set the first truly memorable hand collated set I have. This year is the first year I'm hand-collating the flagship set since 2011. I've finished the first series, and I'll buy jumbo boxes of series 2 and 3 when they hit shelves here too. It's fun, but it won't be the same as that 2011 experience! I hate bat flips. I get the passion, but this peacocking attitude pisses me off. Don't dance in the end zone in football. Don't flip your bat when you hit a home run. Jose Bautista has over 300 home runs over 14 years, and he comes through in the clutch. But I hate bat flips. Really, anyone who showboats loses a lot of points in my book. I'm all about celebrating, but quit being Peter Griffin. Yesterday, I posted about a non-sports card, and today I'll do the same. As I mentioned, a big part of my life is based on entertainment - movies, music, and TV shows. My coworkers would probably tell you at length how annoying I can be when I quote random shows that none of them seem to know. Tara Reid hasn't made the best choices in her life, but she's had some good movies. Underappreciated, in my opinion, are two of my favorite movies, Van Wilder and Josie and the Pussycats. Of course, she was also in the American Pie movies as well as a couple dozen extremely forgettable comedies and horror films. She was able to play the cute girl role pretty well, though I'm not claiming she was the best. She was acting during a teen-movie renaissance of sorts, with a pretty talented group of peers. I think I should pull out my DVDs and cue up Van Wilder tomorrow night!